Angling report by Bill N.
When Kit recounted this conversation to me, I confess that I knew nothing of Slovenia or its fishery. However, after some preliminary research I learned some intriguing facts. Slovenia is a small independent country that was formerly a part of Yugoslavia. It’s population is 2 million people and it is about size of the state of New Jersey. It’s neighbors are Austria and Hungary to the north and Italy and Croatia to the south. Slovenia is not to be confused with Slovakia which was formerly a part of Czechoslovakia. Portions of the country are mountainous, notably the Julian Alps which are primarily limestone and are sometimes referred to as the southern Limestone Alps. The countryside is dotted with picturesque villages, though it’s capital of Ljubljana (“Lube-lee-ah-nah”) is a quaint but vibrant city with a population that exceeds 400,000. The official language of Slovenia is Slovene, however, most Slovenians are fluent in English, having started studying it in primary school. Slovenia is a member of the European Union and its currency is the Euro. From a fisherman’s perspective Slovenia’s Soca (“sew-cha”) River system is home to a unique variety of trout, the marble trout (Salmo marmoratus). The marble trout is related to the brown trout and grows to mammoth proportions. The world record marble trout exceeded 55 pounds. The marble trout’s distribution is limited to Slovenian and northeastern Italian rivers emptying into the Adriatic Sea—primarily the Soca river system. Photos of the Soca River and its tributaries intrigued me. The water appeared to be comparable to New Zealand’s “air clear” waters and the scenery of the Julian Alps, from which the Soca flowed, spectacular. Years before I had set for myself a personal goal of catching a trout on every continent, save Antarctica. Thus, I resolved to put Slovenia on my “bucket list”---the European leg of my continental “slam”. However, I felt the need to plan a trip to Slovenia as more than just a personal fishing expedition. My wife would want to accompany me and she has other interests, notably bicycling. Thus, in 2009 a perfect strategy emerged. Kit was on a cross-country bicycle trip with me driving our personal van as the “sag” (support and gear) wagon. We stopped along the way to visit friends who had just returned from a bicycle tour in the Czech Republic organized by VBT (formerly Vermont Bicycle Tours, www.vbt.com ). It occurred to me that VBT might have a bicycle tour in Slovenia that would interest my wife and if so, how could she begrudge me a few days on the streams of Slovenia!!! And, as luck would have it, VBT had a 3-country bicycle tour which included Slovenia, Austria and Italy, ending in Venice. So, here was the perfect plan. We booked the bicycle tour and I lined up a Slovenian fishing guide, Rok Lustrik (www.lustrik.com) for four days of fishing. Everything was falling into place for the perfect vacation. Ah, but not so fast! Just two and one-half weeks before our mid-September departure, while training for the bicycling tour, I fell off my bicycle and broke my upper left arm at the shoulder joint. It looked like fishing would be out of the question. Although, I could still cast, I had limited use of my left arm to strip line and reel against resistance. Additionally, the doctors warned that a fall could aggravate the injury and require surgery. Ouch! Even with this bad news, I did not cancel our guide since my fishing buddy Doug Camp was scheduled to meet me for the fishing and our wives had plans to hike and sightsee. Further, I still had hope that the arm would heal sufficiently to allow me to fish at least on one of our four scheduled days. After arriving in Zurich, we took the short flight to the Slovenian capital, Ljubljana, a picturesque city with a lively historic center. At the airport we picked up our rental car and, drove 45 minutes to scenic Lake Bled. There we checked into our lodging, the lovely Pension Lukanc (www.lukanc-bled.com ). After check-in I strung my rod and took it out on the lawn of the Pension. It felt good in my hands and I had only minor pain in the arm when stripping line or reeling against resistance. So, I was ready to give it a go as long as Rok, our guide, could assure me that we would avoid steep terrain and heavy current, as I still feared a fall and aggravating the break. Rok would meet us at breakfast the next morning. At breakfast Rok appeared on time. He is tall and energetic with a likable personality and he has fluent command of English and a vast knowledge of the fishery. He had no reluctance about me venturing forth. Then, without further discussion, Rok announced to our wives that we would leave immediately and not return until 7:30PM. Only later did I realize that Rok’s time windows were tied to a train schedule. Shortly after departure we pulled into the nearby train station and loaded our vehicle onto a flatcar. The train would take us out of the Sava River drainage which is part of the Danube River system that ultimately drains into the Black Sea northeast of Istanbul. We traveled by train south through the Julian Alps via an 11 mile long tunnel. On the other side, after a 45 minute train ride, we unloaded the car in the Soca drainage which empties into the Adriatic Sea near Venice. Upon arrival in the Soca drainage, we took a short drive to the small town of Tolmin. There we purchased our daily permits to fish. And, here we learned our first lesson in fisheries management, Slovenia style. The permit was not issued by a government agency, but by the famed Tolmin Fishing Club. The Tolmin Club is noted for being instrumental in preserving the pure strain of marble trout through a program of eradicating the introduced brown trout and hybrid brown/marbles and planting genetically pure marble trout from headwater streams into their original environment, the main stem Soca drainage. We learned from Rok that many of Slovenia’s prime fisheries are managed by fishing clubs under supervision of the government’s Fisheries Research Institute. There are 64 fishing clubs in Slovenia. Clubs may present a fisheries management plan to the Fisheries Research Institute. If the plan is approved, the club is licensed to manage the fishery in accordance with the approved plan. The Institute monitors compliance with the approved plan and determines whether the club will be permitted to continue management in the future. We asked for an explanation and he told us that when the fish was hooked, it launched itself onto a gravel bar at the angler’s feet. The angler, an Italian fisherman, recognized the opportunity and leaped on top of the fish and, in a mud-wrestling match, subdued it. Rok noted that this fisherman is held in high regard locally because he donated the trophy mount to the Tolmin Club and then magnanimously hosted a celebratory feast for all the club members. With our daily permit in hand, we departed for the Tolminka, a nearby tributary of the Soca. The permit stated that fishing is catch and release and angling method limited to a single barbless fly with no added weight. As a consequence of the no added weight restriction, most of Rok’s subsurface fly patterns have oversized heavy tungsten beads to quickly sink the patterns. Rok rigged us with nymphs under small white foam indicators and we walked to the first pool. Here, the Tolminka ran crystal clear with sizeable rainbows and Adriatic Grayling clearly visible. There was no surface activity so we began to cast to individual fish. On my third cast a rainbow of about 3 pounds took the fly and proceeded to put up a strong fight before it was netted. 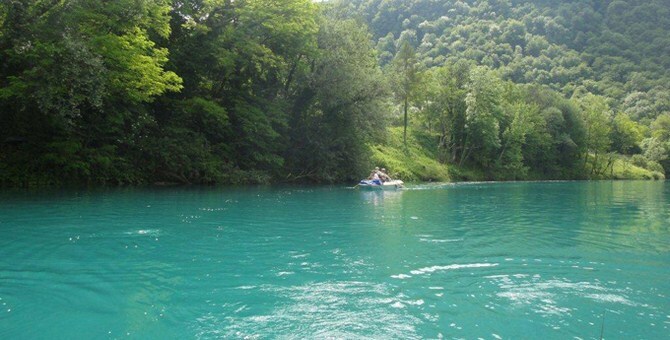 After this initial success, our offerings were ignored and Rok announced we would move on, this time to the main stem of the Soca upstream of Tolmin. This stretch of the Soca is a sizable river, running a beautiful turqoise due to limestone silt from the towering Julian Alps. We had success here mostly blind casting our nymphs into riffles. Again the fish were strong and bright in color. It was here that Doug hooked and lost a large marble trout, our only major disappointment of the day. Altogether on this first day we fished four rivers, all part of the Soca drainage. In each river we were impressed by the size and number of fish. 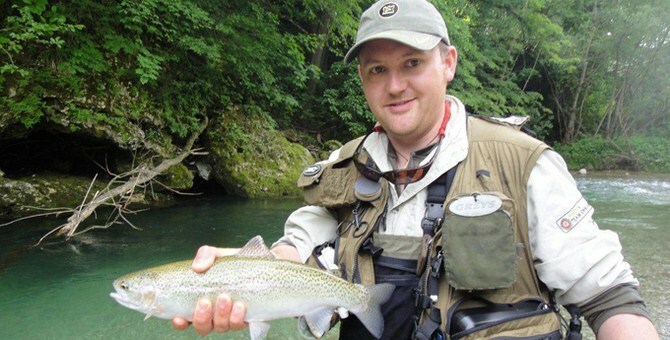 On our third river, a small tributary stacked with rainbows, we learned a second lesson concerning the Slovenian fishery. To reach this stream we walked a considerable distance through an agricultural field. I remarked to Rok that I had not seen any “no trespassing” or “posted” signs on any of the streams. He responded that I would not see any in Slovenia because all the rivers are owned by the government and the angler has a right to cross private property to access the rivers. After a full day we caught the last train back through the Alps to our Pension at Lake Bled. At dinner, Doug and I recounted the day. Doug is a fly fishing guide in southern Colorado and we have both fished many noted trophy trout destinations. We both were impressed with what we had seen on this, our first day. On our second morning Rok announced that today we would stay close and fish the nearby Sava Bohinjka. 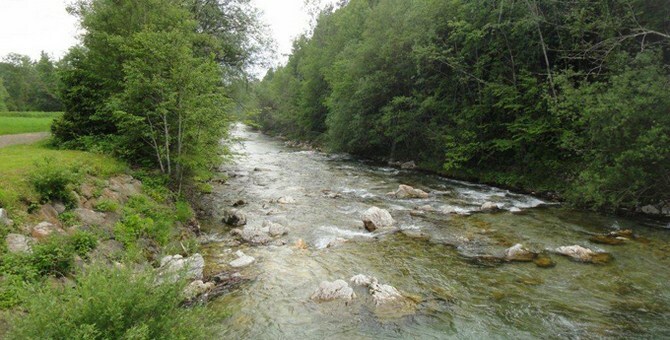 The Sava Bohinjka is a major tributary that joins with the Sava Dolinka near Lake Bled. Downsteam of the juncture of these two large tributaries, the river is simply known as the “Sava”. The Sava eventually drains into the Danube, which as noted, ultimately empties into the Black Sea. There are no marble trout in the Danube drainage, thus, our primary focus for this day would be rainbow trout and the Black Sea grayling (thymallus, thymallus). We might also get a glimpse of the major predator of the Danube system, the “Danube Salmon” (hucho hucho). The Danube Salmon is not a salmon, but rather it is a relative of the river dwelling Mongolian taimen (hucho, taimen). The Danube Salmon is a fish predator that grows to as much as 50 pounds and the fishing season for this species is November to February. This second day of fishing was as remarkable as the prior day. After a stop to pick up our daily permit issued by the Sava Bohinjka club, we pulled off the road overlooking the River. There, below us, in crystalline water were large rainbows lined up in the current. Again, there was no surface activity. Again, we would fish with weighted nymphs under foam indicators. We waded into the river and made long casts to sighted fish. For most of the morning we had steady action. These were subtle takes by big fish. Our largest of the morning was a strong rainbow that I landed after a good fight. We estimated that fish at eight pounds. Doug landed a rainbow of six pounds, but most fish were between one and three pounds. We each hooked strong grayling, but after spectacular aerial displays, none were landed. Late in the morning Rok signaled for us to follow him through the underbrush on a high bank overlooking a deep pool. There he pointed out a large shape lying on the bottom. He said that it is a Danube Salmon which he thought was at least 35 pounds in weight. With that he tossed a large rock into the stream and the shadow streaked downstream and out of sight. fisherman due to private property restrictions preventing access and, in some cases, poor fisheries management. Because the Slovenian fish are pressured, it is a technical fishery where presentation is critical. I would compare it to spring creek fishing in Montana in terms of its technical demands. In our two days of fishing we had seen a few other anglers, however, there is so much water available that we did not feel crowded. But, there is no doubt that the fish see fishermen and, as we learned, some are very accomplished. The next morning we were met by a replacement guide, Sebastian Podbevsek. Rok had a family emergency this day and arranged for Sebastian to guide us. Sebastian announced that we will drive north and cross the high Alps at Vrsic Pass to access the upper Soca River drainage. If we had done nothing else that day, the drive over Vrsic Pass alone would have been made the day memorable. The road was built during the First World War by the Austo-Hungarian army using Russian prisoners of war as slave laborers. The narrow road travels up an incredibly steep escarpment with 25 hairpin turns on either side of the pass. On the north side there is a Russian chapel to commemorate the men who died building this road. Many of these Russian prisoners were victims of avalanches. At the top of these Alps, in what was known as the Soca/Isonzo front, the Austro-Hungarian army faced off with the Italian army. For 26 months the two forces slugged it out in classic trench warfare. Neither side gained more than a few yards until the Italian line was breached and the battle lines shifted far to the south, almost to Venice. During the stalemate, it is estimated there were more than a million casualties in the valley of the Soca. Though the details of this brutal conflict are not well remembered in the west, there were some notable participants. Erwin Rommel fought on the Austro-Hungarian side and later earned fame as the “Desert Fox” of Germany’s North Africa campaign. Benito Mussolini fought on the Italian side and later ascended as “Il Duce”, dictator of Italy. Another notable in this conflict was the young Ernest Hemingway who drove an ambulance for the Italian side and was wounded in the fighting. Hemingway describes the Italian retreat in his novel, “A Farewell to Arms”. As we descended from the pass into the upper Soca, I was jolted by the incredible scenery, the white limestone of the Alps and the sapphire blue of the upper river. We stopped at a tavern where we were issued our daily license. Without moving the car, we followed Sebastian from the tavern for a half-mile to a small feeder stream. Here the stream was about 15 feet wide with a few pools that appeared to be 4 or 5 feet deep. Numerous trout and grayling visibly finned in the crystal water. It was about 10:30 in the morning and a sparse mayfly hatch was under way. Two large trout were surface feeding along a rock wall. One of the two feeding fish was noticeably darker than the other fish in the pool. Sebastian thought that it was a Marble and we concentrated on it casting small dries. I put several good drifts over the marble and it showed interest, but rejected pattern after pattern. After each rejection Sebastian tied on a new pattern. After about 30 minutes time the fish had rejected 5 patterns. After the fifth rejection Sebastian announced “we change again, he will make a mistake”. The sixth pattern was a size 20 classic upright, a simple tie with a thread body, hackle tip wings and sparse hackle. And, sure enough, the trout made the predicted “mistake”. On the first drift, the fish slowly rose and confidently took the offering. When it was landed, I was exhilarated at the sight of this specimen of the rarest of trout species. The fish had darkly mottled olive coloring, was about 20 inches in length, and had an unusually large head and slender body. Sebastian explained that marble trout convert from insect eaters to fish eaters at about this size. Consequently, pursuit of larger marbles is usually limited to casting large streamers to sighted fish. The larger fish are, however, more nocturnal in their feeding habits and they tend to conceal themselves under large rocks or undercut embankments during daytime hours. In addition to the marble, Doug and I landed several nice rainbows in this small tributary. During our time Sebastian worked with us both on some nymphing techniques and he promised some additional education in the afternoon when we would fish the main stem, after beers and bratwurst at the tavern. Well fed, we drove a mile up the main stem of the Soca. Here the river was 50 to 60 feet wide with visible fish along the far bank. Sebastian demonstrated a technique for this water. He cast quartering upstream with a weighted nymph about 7 feet below an indicator. As soon as the line hit the water, he would make a quick downward flick of the rod with his wrist. The rod tip would dip from about the 11 o’clock position to 9 o’clock. This quick movement would send excess line out toward the fly to minimize drag from intervening currents. I tried to duplicate the effect with a typical mending motion, but found that his “flick” mend was far more effective. Of equal importance to the “flick” was the next move. Sebastian would immediately raise as much line off the surface as possible without disturbing the drift. He explained that the grayling are “quick strikers”. Hooking percentages dramatically improve by maintaining as little line on the water as possible while maintaining a drag-free drift. For a couple of hours Doug and I worked on these techniques. Just as we were becoming proficient at the “flick” mend, and line lift, the sun sank behind the towering peaks and it was time to return to Lake Bled. As we were walking back to the car I asked Doug if he had learned anything today. He responded, “I learned that I’m not as good a nymph fisherman as I thought I was”. I said “I learned the same thing”. The next morning, his family issue resolved, Rok picked us up for our last half-day of fishing. In the afternoon Doug and I would have to pay penance for our fishing days by joining the bicycle tour group at our hotel in old town Ljubljana. But for half a day we would fish on the big river, the Sava. Here, Rok promised we would be fishing for big, strong rainbows and Black Sea grayling. There are also some browns in this section of river. Our morning of fishing was again eventful. Here on this river of about 200 feet in width, Doug and I worked on our “flick” mends and line lifts. We hooked and landed some very strong fish, deep-bodied rainbows, graylings and a single large brown landed by Doug. As we fished, I felt that my hooking percentage had dramatically improved. And I started daydreaming about how I would use the flick mend and line lift techniques on my home waters of the Rio Grande and Conejos of New Mexico and Colorado. Doug and I wound up our half day on the Sava staring down from a bridge as Rok pointed out two large Danube Salmon lying side by side in a deep pool. Not far away we could see a rainbow that had to be at least ten pounds quietly finning in the current. Another memorable river, another memorable day! Our stay in the medieval center of Ljubljana was not a let down. Here, on the banks of the Ljubljanica River the old town is a lively mix of riverside restaurants, open air music and winding alleys and pedestrian ways through medieval architecture. And, overlooking it all, an impressive hilltop castle. Altogether, we spent 2 weeks in Slovenia, which included several days bicycling along the Julian Alps and then into Italy and Austria. Along the way we passed impressive ski resorts and extensive bicycle trails. We also visited southern Slovenia’s wine growing area and limestone “karst” area of impressive caves. In addition, we took in a performance in Lipica at the Lippizzaner horse stud farm originally established 1580 by the Austrian Archduke Ferdinand. Then after a few days in the small but scenic coastal town of Piran, we left Slovenia for a three day stay in Venice, and our flight home. 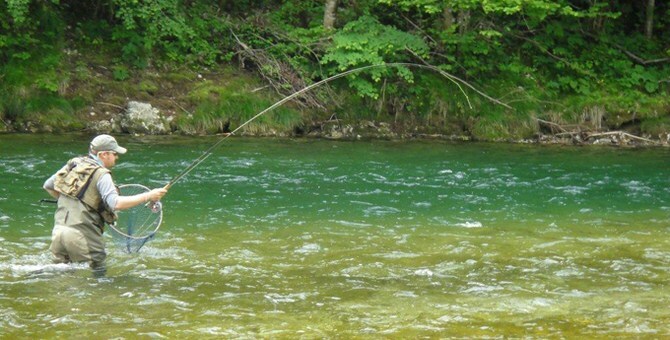 All in all, Slovenia and it’s neighboring countries offer many attractions for the traveler, but for a serious angler, none rival the beauty and quality of the rivers and fishery of Slovenia. As Kit and I flew home I fondly recalled how this wonderful travel experience started on an airplane flight many years ago with the statement from a fellow fly fisher “. . . tell him to go to Slovenia”. 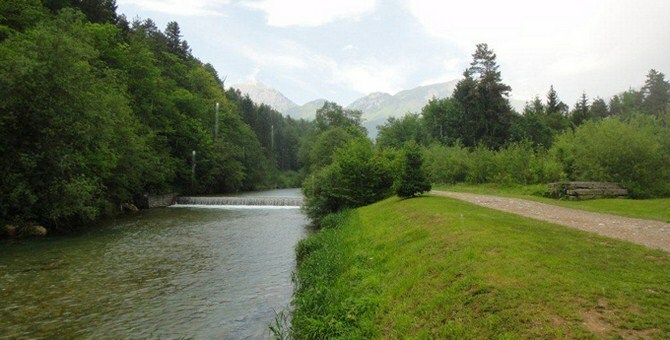 The 2012 World Fly Fishing Championships were held in the stunning, fish filled rivers of Slovenia, a small country in size but vast in terms of angling opportunity. Team England consisted of Paul Page as Manager, John Horsey, Simon Robinson, Phil Dixon, John Tyzack and myself with Scott Nellins as reserve, a strong squad with a wide range of skills and experience across both rivers and lakes. Our campaign began a week prior to the actual championships at our team base. We settled immediately into the very comfortable and friendly atmosphere of our guest house. Shortly after arriving we were treated to an excellent home cooked meal and a welcome drink - things where already looking good! Despite the relatively short journey time to Slovenia from the UK it was an exhausted England Team that hit the sack early ready for the start of our intense practice sessions. We met Rok Lustrik, our guide (www.lustrik.com) for the week who Paul, our manager had lined up to provide the team with practice water that would closely mimic the actual competition venues of Sava Bohinjka , Main Sava , Kokra , and the lake at most Na Soci . The plan was to train for one day on each venue or if not possible due to competition restrictions, on water as closely matched as possible to the competition venues. Practice week flew by with many fish caught on an array of methods and flies including some stunning grayling up to the magic 50cm mark and, although the one fly rule of Slovenia's fisheries did limit the tactical options to a degree we had a good tight range of nymphs, dries and streamers that we knew would catch in all the venues depending on water type. As always the final captains meeting was a tense affair with all the teams nervously awaiting the draw for groups. Team England was no different and although we all had our own preferred draws in mind there is nothing that can be done - you simply have to fish what you get and make the most of it. My own draw was the direct opposite to what i had hoped for, with the Sava Bohinjka (the post productive venue) first and the Kokra (possibly the hardest venue) last. I knew this would possibly make for blank avoidance tactics in session five depending on the beat draw and as with all these comps the dreaded blank must be avoided at all costs due to the heavy penalty points awarded for a clean sheet. I stepped off the coach on the first morning surprisingly relaxed, although a touch apprehensive as to what I had drawn, down a tunnel through some bushes and along a riverside path I followed my controller until we broke through next to a stunning run split by a foot bridge - it was a good draw! When the whistle went for the start of session one my small black nymph hit the water and an immediate indication resulted in a hooked Brown Trout of 35cm... I was off to the races, first cast; it really can't start any better! The next three hours as always flew past I fished only one rod my long serving Greys 9.6ft #3 XF2 Streamflex Plus with the extension section fitted and my own design of leader that I can pretty much fish any single fly technique from. I switched from nymph to dry frequently as I fished the beat and often caught two or three fish on the dry before fishing the same pocket with nymph (pic 3) for another two or three fish before moving on. My 200m beat had too much fish holding water to fully cover so I concentrated on the best areas and just on the final whistle fish no 26 hit the net. In practice our guide, Rok had guessed that 20 plus fish would be needed to win the first session on the Sava Bohinjka - was he right? On the coach the numbers filtered back from the other anglers in my group and it looked like 26 had been enough for first place, my other team mates called in and John Horsey had also won his first session on the lake with 5 so it looked like a good team start to the Championships. My rotation saw me drawn on the upper part of the Sava Bohinjka an area I had fished in practice for the 2006 Europeans so I had some prior knowledge of the beats. Off the coach at the second drop off point and my beat was immediately next to the road in an area I knew well - I could see fish cruising in a ‘blue hole' a term we applied to large deep back eddies some seemingly bottomless so signs were good. With two hours to spare prior to the start I had lots of time to form a plan, when the whistle went I headed for the shallow water and hopefully the numerous small wild Rainbows that seemed to like this type of water, choosing to ignore the big 40 -55cm rainbows that cruised in the deep water. These bigger fish receive lots of angling pressure and although well catchable eat into the short three hour sessions as they take longer to subdue on light tackle. Again, my tactics of one rod and switching between dry and nymph paid off with 24 fish in my three hours placing me second behind the Spanish angler with 23 slightly larger fish. Three place points from the first two sessions was enough to tie me on points for the lead at the end of day one although my larger fish point score nudged me into first place over all. At the end of day one England held 8th place with everything to fish for in a competition where results can change wildly from session to session. This saw me draw the lake, part of the Soca System and a lake but not as we know it! Similar to lots of the lake venues in World and Europeans the host nation had chosen a venue with a river running through it creating a strong flow in places, back eddies and as it was part of a hydro system changing water levels to confuse things further. Armed with excellent info from England's first session win by John Horsey I headed for the same area but with different flies as the water seemed to have cleared over night and the fish had now had some pressure. With almost all of these lake sessions avoiding the blank is the first priority so the first fish and when you catch it is key - get one early and you normally go on to a good score, struggle for a take in the first hour or so and the nerves creep in and you often don't fish as well as you could. When the start gun went off I was mid way through re attaching a fly and almost fell out of the boat with the shock! My first cast with my 9.6ft #8 Hardy Zenith and di5 40 plus with a dark olive damsel pattern tied by my good friend and former England team gold medal winner , Davy Parker was met with an instant take which I missed! When I started the retrieve on my second cast I was still cursing my mistake but that changed pretty quickly as half way back to the boat the line locked solid and a chunky Marble Trout went airborne trying to throw the barbless hook. Typically when you desperately want to land a fish it does everything it can to escape and the fight was overly long thanks to the nerves and apprehension of trying to get the all important blank avoiding first fish in the net -thankfully it stayed hooked and the blank was avoided 6 minutes into the session. I worked away at the same area for the full three hours and was rewarded with 6 takes for four fish landed, mainly to the hang. This was enough to place me 4th and as I was to find out later, keep me in the individual lead. At the end of the third session on day two all fishing stops as the afternoon is a ‘rest session' to allow exhausted anglers to recover from the 5am starts and the 1am bed times and the extreme effort everyone puts into the competition. Back at the hotel the team results showed England had slipped to 11th place but still all the team rallied following Paul's team talk and we still knew we had everything to fish for. The last day dawned and at 5am. I studied the catch results from the two rivers I had to fish that day to have an idea of what I would need to stay in the running individually and to not let the team down. Arriving at the main Sava on beat 1 it was clear that my draw was not a great one. The three previous anglers had managed 8 fish in session 1 then 4 and 4 and only one good holding area was obvious - unfortunately it was on the other side of the huge river at the top of the beat - my only route to which was a deep wade across the tail a run 200m through the woods and then a wade /swim diagonally across the river to get me back to the controller with a fish . I made the decision to concentrate on that area and made the crossing 9 times in three hours each time with a fish, one was 1mm under size and was not counted but I finished with 10 fish hooked nine landed and 8 to score so was happy with my performance on a hard fished poor beat, 8 fish was just enough for a 9th place in the group. And so the last session of the 2012 World Championships arrived and the Kokra river - the most inconsistent of all the venues and now also one of the hardest fished, as its small size and shallow nature resulted in few if any fish that had not seen an anglers' fly in the last three days. My beat was good with many features and had fished well but it had also had some exceptional anglers fishing it including Spanish, French and Italian. The scores had fallen quickly with 27 in the first followed by 14 then 11 then 1. Whilst I sat on the bank rigging my gear a huge Grayling rose from nowhere and took sedge from the surface - at least they had left me one I thought! I crept to the water's edge and waited for the start, the Grayling's rises were inconsistent and it actually refused a few real flies so I was a touch worried it may not eat my artificial. Luckily a short drift with a rod tip induced ‘hop' of the fly proved to be too much and the fish took my CDC sedge in a smooth rise. I took advantage of the first split second of confusion of the fish and jumped on it with the net as I had dropped to 0.8 tippet to get the take and didn't fancy a long fight in pool full of obstacles! That fish went 48.7 cm and was a real beast, unbelievably my second fish was a 47 .5cm Grayling caught in almost the same manner in the next run. After these two early fish it became apparent how hard the water had been fished and I resorted to crawling on my knee pads and exploring every inch of the beat with dries and small green sedge pupa. I hooked 11 and landed 9 for a 7th place and looking back I know I could not have made any more of that beat so was happy with my position in the group given the water I had. At the end of the event when all scores had been tallied and checked, England as a team had fought back to 7th place overall and I had finished two points short of the medals in fourth place. Of course I was disappointed with not reaching the medals both as a team and an individual however to place 4th in the World Championships is still an achievement I will treasure although I haven't given up on improving it quite yet! In summary the fishing and the event organisation was superb with the organisers trying to ensure as fair and level championship as possible. No stocking took place for four months prior to the event and stock fish played no real part in the scores, although some very poor water had been pegged in the match sectors resulting in some ‘grave yard' draws that even the best anglers in the world could find no fish in whatsoever, so as always there was a degree of ‘luck of the draw' involved. The final team results saw Czech lift gold with Italy and then Spain, individually Spain took gold with a flawless performance from David Arcay followed by Italy and then Czech. For me this was one of my most enjoyable World Championships with great crack amongst the team and excellent organisation and leadership from Paul Page as manager all helped along by some great fishing and scenery. "For my money, anyone who comes in the top ten at a World Championship has done supremely well. When you look at the beat averages, the real picture comes into view. When you catch more on a beat than anyone else has done, when you turn an average beat into a good one, when you catch more fish in a beat on the final session than anyone did in the earlier days, those are the things that show class. The ultimate truth in the World event is that you can't catch what isn't in front of you. It's the luck of the draw - all you can do is to reduce the luck element with your skill. "In my humble opinion, Howard is the best angler that England have had for a very long time. At Hardy & Greys we know how lucky we are to have that kind of expertise on the product development team, but outside of these circles he is less well known. He's quiet, un-assuming, and just gets on with the job." Howard Croston is Hardy & Greys Catagory Manager and also current world team member. Throughout my short fly fishing career I have had the pleasure of fishing many beautiful and wild locations across the globe. But without a doubt the most breathtaking place was Slovenia. With the stunning scenery and never-ending fishing possibilities you can find yourself in awe of the locals. Fly Fishing Slovenia Welcome to Slovenia! We travelled with one of Slovenia’s most prolific guides Rok Lustrik www.lustrik.com who was not only a very experienced guide but also a true gent. The fishing package consisted of 7 nights and 6 days guiding. The Flights were easy and Rok arranged all the transit between airport and destination. To experience everything that Slovenia had to offer we split our time fishing both of the main river systems and its tributaries, the Soca and Sava. The Soca is probably the most famous alpine river in Slovenia, and rightly so, with its very different tributaries. Set in breathtaking scenery overlooking the Julian Alps, it is home to the most fascinating and elusive fish species in the world – the marble trout – as well as Adriatic grayling and rainbow trout. Fly Fishing Slovenia2 Welcome to Slovenia! The river Sava is the longest alpine river in Slovenia. It starts divided into two forks, the Sava Bohinjka and Sava Dolinjka rivers. The upper part is world-famous for its grayling as well as for large rainbows and good-sized browns. In the wintertime, it is ideal for fly-fishing for our land-locked Danube salmon. Fly Fishing Slovenia3 Welcome to Slovenia! During our time in Slovenia we managed to catch every species they had to offer. Gorgeous Golden brown trout, the slender Lady of the river the Arctic Grayling, the elusive monster of the river the Marble trout and the playground bully the Rainbow Trout. Armed with excitement and enthusiasm we headed to the river. As soon as I was on the bank I knew we were in for a treat. Rok set me up with a simple cast of around 6ft of 3.1lb Airflo Ultra Strong Co-Polymer, with a single copper john size 16 and an indicator. Within 5 casts I was in to my first fish of the trip. As soon as I hooked up I knew what I had on, with the head down wiry fight I knew I was in to a Grayling. My 10ft #3/4 Streamtec Nantec fly rod was bent double and with a single lift of her dorsal fin more line came poring off my Vosseler RC L. And with a little determination I managed to land her. Fly Fishing Slovenia4 Welcome to Slovenia! Well worth the trip in its own don’t you think?? Through the days fishing it just got better and better with incredible river systems and stunning scenery. The quality of fish that we had was just incredible and the style of fishing for them is a whole different experience. Mainly Nymphing with an indicator seemed to be the most favoured plan of attack. And boy was it affective! With this stunning PB River caught Rainbow of 5lb 3oz coming to a 16 Woven Nymph. Fly Fishing Slovenia5 Welcome to Slovenia! One of the days we experienced a heavy downfall of rain and with the rising river we started to admit defeat for the day……..But no, I could hear a splashing downstream and as I turned to look I could see Rok running back upstream and shouting “MARBLES” witch I must admit at that point I thought that is precisely what he had lost ! But no as he came nearer he explained that when the river is starting to flood there is a strong possibility of getting the shy Marble Trout. Rok then began taking out these flies of which I can only describe as being leaded bunnies! This fly was tied on a size 6 hook with a huge jig head and covered in white zonker strips; it resembled nothing I had ever seen before. He then began to tie this fly onto my line, baring in mind I still have my river gear i.e 10ft #4. Rok then explained how you fish for these “Marbles” ‘just lob it out and strip as fast as you can!’ Now I did not hold high hopes for this method and must admit was slightly beaten before I started, thinking the pub is calling !. But I kid you not In the first three cast I had two fish hit the fly like a steam train. This is fishing like I have never seen. In that few hours of fishing I managed 6 Marble trout. It is the most savage and aggressive take I have ever experienced out of all the fish species I have caught. When you are stripping the “fly” back you just see the shadow of the Marble appear out of nowhere. Without a doubt one of the most heart stopping fishing I have ever done. Now there is very little difference between a marble and a brown trout as you will see from the below picture. Fly Fishing Slovenia6 Welcome to Slovenia! The world of fishing in Slovenia had taken me by surprise and there was still one left hidden. I had not experienced this personally during the trip but my father Greg Cann managed to pull out another surprise. In the river systems when a Marble Trout and a Brown Trout breed it creates a Hybrid. Now this fish inherits both of its parents attributes, the turbo charges hunger of the Marble and the gorgeous colouration of the Brown. And this truly was a lovely fish. Fly Fishing Slovenia7 Welcome to Slovenia! Throughout my fishing in Slovenia I have been truly inspired by not only the fishing but also the landscape. How the rivers define the country and weave through it like veins. And I can honestly vouch for the superb quality and service you get with Rok Lustrik he truly makes the experience that more special. I have now been on two trips to Slovenia, once in 2009 and again in 2010. And am now planning another trip there!. If you are looking for a fishing experience of a lifetime I strongly recommend you visit Slovenia.